An experience of a lifetime awaits you onboard the magnificent New White Manta. Stable, spacious and safe, she is fully equipped to take you on a fascinating diving adventure in the magical waters of Layang Layang and Pulau Tioman in Malaysia, as well Pulau Anambas and Acasta Reef in Indonesia. The New White Manta is possibly the largest purpose-built RINA CLASS dive vessel in the region. 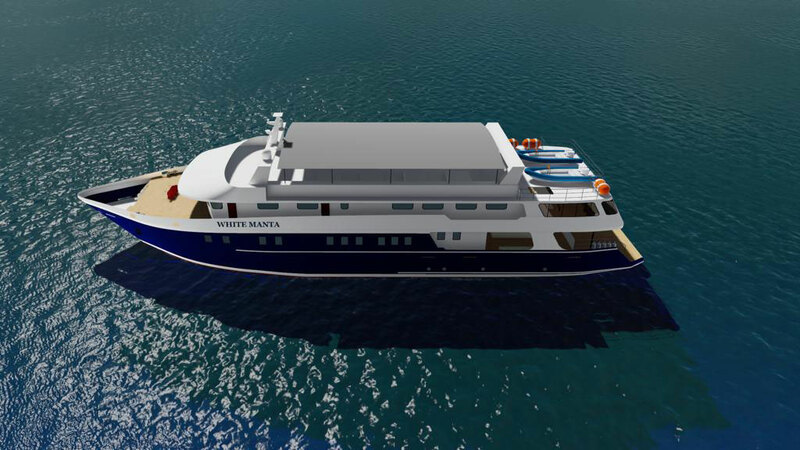 Measuring 46m (150 ft) by 10m (30ft), this steel hull vessel will take 24-32 guests depending on the cruise destinations. 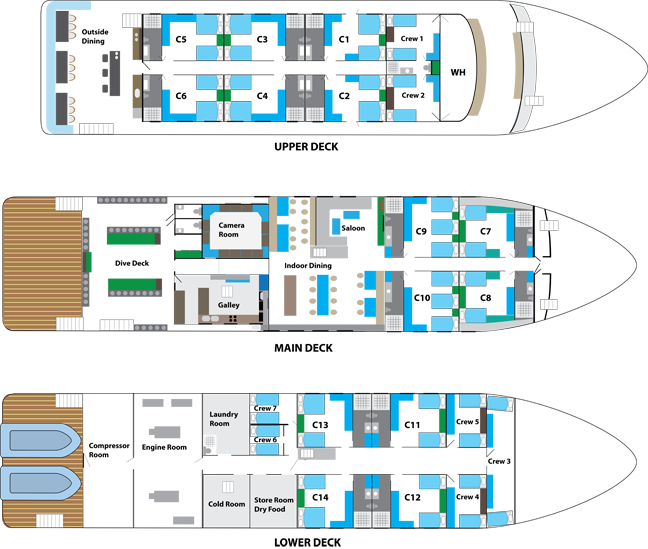 The 14 beautifully furnished en-suite cabins, each average 20sqm (200sf) in size, an open outdoor alfresco dining area, an indoor air-conditioned room for dining, speaks of the perfect onboard ambiance of a world class dive holiday. With maximum comfort and safety in mind, the New White Manta is well equipped with safety facilities, cruises at 10 knots and the steel hull makes her an ideal vessel for long haul cruises and blue water crossing trips. The New White Manta is built with thick steel designed to withstand the hardest sea conditions, offering the stability wooden boats cannot. The 10m width and weight of 580 ton add to the steadiness and ensures uninterrupted rest and relaxation. The New White Manta is a world class cruising hotel. Built for sea-worthiness, the New White Manta operates on twin engines and is an ultimate dive vessel for long haul cruises and blue water crossing trips. She is dependable for comfort, convenience and a stress-free dive holiday. The New White Manta will take 24-32 guests depending on destination and if booked as a full charter. There are 14 beautifully furnished en-suite cabins, each average 20sqm (200sf) in size comprising of twin/double or triple share cabins. The New White Manta is equipped with camera-friendly facilities, designed for the most avid underwater photographers. Having good food should be one of the most important criteria when choosing a liveaboard. On the New White Manta you start your day with freshly baked breads. With no less than 5 meals a day, you will be filled and satisfied with an extensive range of treats for your taste buds. The onboard Wi-Fi is connected via Satellite and with 24/7 Wi-Fi connection you can be connected with your family and friends anytime, anywhere.